The following are some links that give a better understanding of our unique line of Wing Chun and some other links that we have found useful. Enjoy. Follow Us on these sites. Based in Sanford, Fl. He is the Wing Chun visionary who's hard work and studies unlock the secrets of Wing Chun. Based in Jacksonville, Fl. He is a direct student of Karl Godwin and excellent in long bridge theory. Based in Jacksonville,Fl. His self defense system in anti-grappling and Wing Chun boxing is vast and furious. Based in Jacksonville, Fl. Jesse is an encyclopedia of Wing Chun knowledge and precise technician and practitioner. 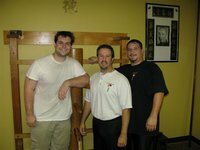 Based in Clarksville, Ga. Kevin is an exciting Wing Chun practitioner. Based in San Clemente, Ca. Adam's philosophy of bringing Wing Chun lineages together has been a positive boost for Wing Chun. The immortal that brought Wing Chun to the masses. He revolutionized so much in such a little time. Copyright 2009 wing chun fight club. All rights reserved.